Apple is widely expected to launch two new iPhones later this year with screens larger than the 4-inch display on the iPhone 5S. Most reports say one of the iPhone models will have a 4.7-inch screen and the other will have a 5.5-inch screen. 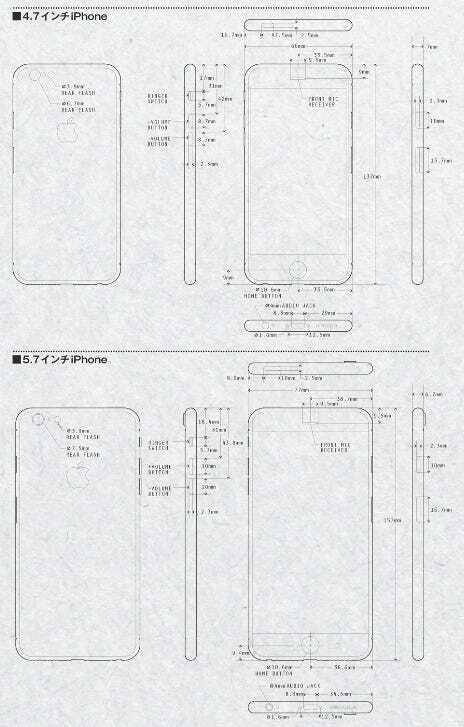 Earlier this week, a Japanese publication called MacFan printed a schematic that it says shows dimensions and designs of the new iPhone models. MacRumors first picked up the graphic. Of course, there's no way to tell if this is true or not, but it does agree with all the chatter we're hearing about Apple's next iPhones. Apple will likely announce new iPhones in the fall.